Ping-ping, ping-ping-ping …'Asteroids' opens like the classic 1979 Atari video game of the same name, with asteroids getting shot down one after another until the outline of a Hummer enters the frame repelling all attacks and seeing off the aggressor as it speeds right off-screen to hurtle across the Californian dessert as a real Hummer H2. Like no other sports utility vehicle on or off road, the Hummer H2 is clearly big, fast, and indestructible in both Asteroids and Big Race, two very different spots directed by Nick Lewin and made to air only in the USA. At The Mill Angus Kneale used Atari 'Asteroids' game footage to choreograph the moves of the spaceship striking the asteroids and incorporated the drawing of the Hummer. 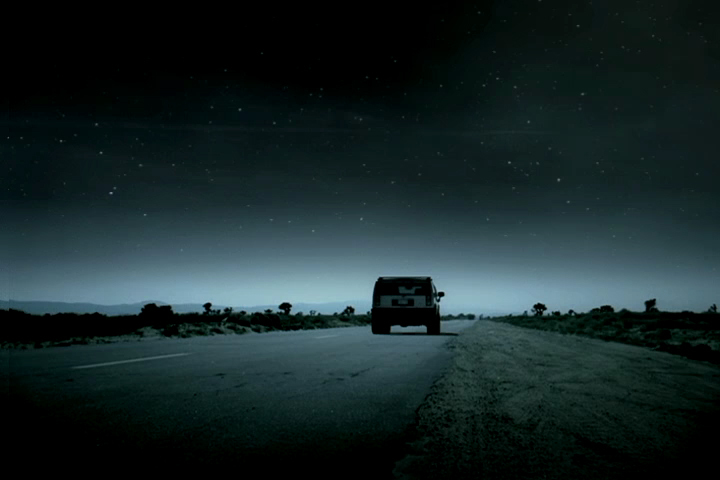 For the final live-action scene of the speeding Hummer various telecine passes were needed to create the luminous evening sky, and a myriad stars were added in Flame. Both 'Asteroids' and 'Big Race' end with a 3D earth pullout. Created the year before by The Mill 3D artist Aron Hjartarson for the launch of the Hummer H2, the earth pullout was modified specifically for the commercials. Night-time texture maps of city lights were painted in Photoshop and processed through Softimage for 'Asteroids'.